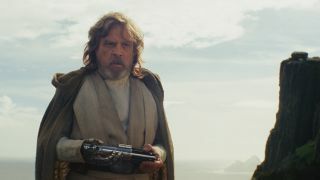 Luke Skywalker's turn away from the order he helped rebuild in Star Wars: The Last Jedi came as a big surprise, but if it was up to Mark Hamill we may have had an even bigger one. In an interview with SFX (out now), the actor revealed some of the thoughts he had about Skywalker's future before the new Star Wars trilogy set it in stone. Subscribe: Sign up for a monthly subscription to SFX magazine and get news and interviews on all the biggest sci-fi entertainment delivered straight to your mailbox and/or mobile device. "You would assume that after saving the galaxy the way he did he would become, like, a venerated member of the high Jedi order," Hamill joked, "sort of like a cardinal or a monsignor, who knows, maybe the Pope of Jedi!" Then it got serious. And weird. Seriously weird. "My son Nathan is the real Star Wars buff," Hamill said, "and he told me years ago, 'Dad, there's this great story where they clone an evil Luke from your severed hand [Luuke Skywalker in The Last Command, a 1993 Star Wars novel].'" I said, 'Oh, baby, would I love that?' Not only could you get to play your evil twin, but what a great idea that you bring Luke back, and the audience starts noticing him undermining the heroes, cutting their fuel supply inexplicably, maybe even killing one of the supporting characters. It would be so mind boggling, and then of course the real Luke shows up and that mystery is solved. But there's too much Luke, and it's not my story anymore. "When I suggested it to [Star Wars: The Last Jedi writer/director Rian Johnson], he said he thought that was a cool storyline too, but it's been done. Rian had to find a way to take elements of the movies that everyone expects to be there – the action, the adventure, the special effects, the creatures and humor – so that everyone feels they're having a Star Wars experience, but also bring something new to the table, that's challenging, that hasn't been done before. I think he's done it. This one doesn't feel like any of the others to me, aside from the elements I just spoke about. People say, 'Is it more like Jedi, is it more like Empire?' I dunno, it's sort of like its own thing." Check out our Star Wars: The Last Jedi info article for more insight into this definitely-not-a-clone version of Luke. And make sure you pick up a subscription to SFX Magazine for more exclusive stories about the film before it hits theaters in December.